After the welcome and the presentation, the participants of the meeting were able to share their concerns and their expectations of the meeting. Soon it became clear how much the current public political discussions and the tightening of the laws effected, agitated and worried the refugees. At the centre of all these concerns were the deportations to so-called "safe third countries" and to the countries of origin. In the discussion it became clear to everybody that the key to defending their rights was self-organization. "Wherever we are, in the isolation camps, in the communities and cities, we must define for ourselves what happens to us and stand up for our rights. We must publicly denounce them and expose the lies spread on a daily basis. The organization means that we call the experienced injustice and join forces with those who are also excluded and affected. In doing so, we must overcome our divisions. Only when we know what our common demands and goals are can we enter into alliances with others in society". The roles of non-governmental organisations or charitable organisations were also discussed extensively in the discussion. They can all act within the framework of the law and work according to their mandate from the owners. But if the laws violate universal human rights or the Geneva Refugee Conventions, if the governments with which refugees seek protection are partly responsible for the misery from which they have fled, if all parties move to the right, there is no alternative but to organise themselves. 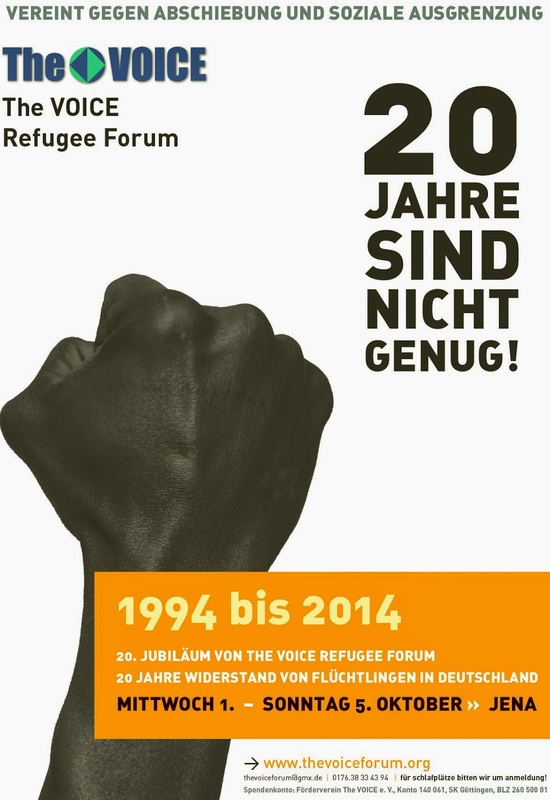 One activist summed up: "These are the lessons of more than 20 years of struggle between THE VOICE Refugee Forum and KARAWANE for the rights of refugees and migrants. The fundamental human rights to life, freedom of movement and dignity are inviolable, but they must be fought for every day. They can be led in individual campaigns by individuals or groups for the defense of our lives, but at the same time it would help many others concerned and give strength for the further fight. On July 14 and 15, 2018, another open meeting of the KARAWANE refugee women's movement will take place in Hamburg. Among other things, possible campaigns to defend refugee women present in Berlin will be discussed there.